We know that radiation is dangerous for our health since it interferes with the process of cell division in our body. What is more, there are many different causes and types of radiation we are supposed to keep ourselves away from. Basically, there is an acute radiation syndrome affecting us due to temporary exposure to radiation and chronic radiation syndrome taking place after radiation exposure in the long run. Also, we can be exposed to radiation internally and externally. This means that the radiation can be emitted from the inside of our body, like after consuming something radioactive, or from the outside, like after being exposed to an outside device which emits radioactive rays. Read on to learn more about this life-threatening phenomenon. 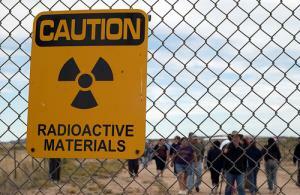 What is Radioactive and What Can It Be? There are many different sources of radioactive emission, causing us to get radioactive poisoning due to exposure. One of the main sources of radioactive elements is warfare since here many nuclear weapons are used. These are all radioactive and cause numerous health problems. For example, fallout material from a nuclear explosion is capable of emitting heat radiation which causes burns. However, gamma rays from a nuclear explosion cause much more damage. Since all these weapons are produced in nuclear reactors, these are causing the radiation sickness too. Moreover, these materials being hard to control often cause explosions and accidents, leading to exposure and, therefore, poisoning. Also, handling radioactive materials inadequately or without proper protection can cause body damage and radiation poisoning easily. Once a person has been exposed to radioactive elements, his/her blood cell count drastically decreases. Therefore, immunity of this person is jeopardized and this individual may become sterile, suffer from nausea, headaches, internal bleeding, bone marrow deterioration, diarrhea and dehydration. The worst case scenario is an extremely painful death, with no cure or a chance of prevention since we are still to learn how to treat radiation damage successfully. The only way to stop radiation from damaging your body, is to stay away from it. Those who need to be exposed to radiation should only do this in a minimal timespan, being as far from the radioactive device as possible. Proximity is known to multiply the effect and strength of radiation. Also, people who work with radioactive materials need to wear protective equipment and suits, handling these materials with extreme care. Impregnated my wife while I had radiation sickness. What are the chances of birth defects? sciatic nerve damage from radiation?